Chicories are heartier than lettuce, crisp, and wonderfully bitter. What draws me to chicories are their colours, ranging from pale greens, pink speckled, or deep purples. I’m fortunate to live near an Eataly which has a wonderful collection of gorgeous Italian chicories including Castelfranco, Radicchio Del Veneto (beautifully pink! ), and frisseline. 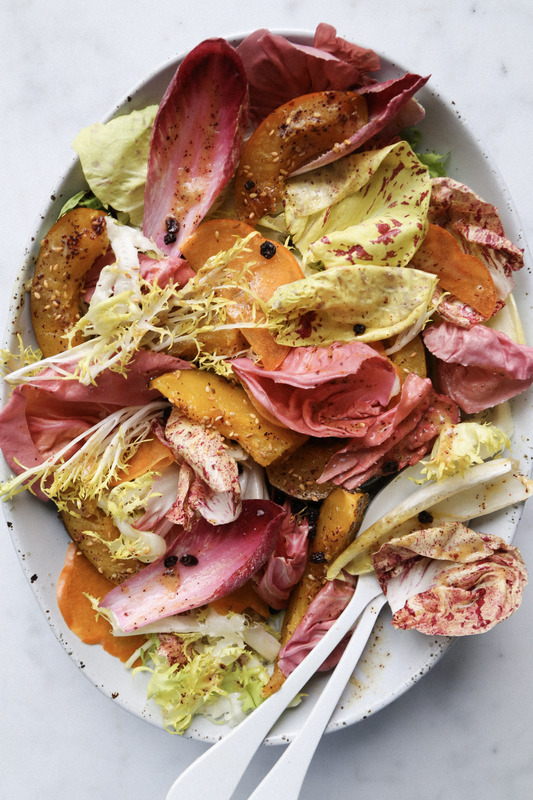 However, this recipe is equally as delicious with easier to find chicories such endive, frisee, escarole, and radicchio. What’s great about chicories is they can withstand a bold dressing, like the sumac vinaigrette featured in this recipe. It’s garlicky, sweet, acidic and has a punch of sourness from the sumac. Sumac is a beautiful Middle Eastern spice with a tangy lemony flavour. Unfortunately, It can be difficult to find at a local grocer. You’re best off finding it at a spice shop, middle eastern grocery stores, or Amazon. With that said this dressing is also delicious without the sumac. Preheat the oven to 375° F. Whisk together the olive oil and honey. Arrange the squash on baking tray and drizzle with olive oil mixture and sea salt. Roast for 30-35 minutes, flipping halfway. Sprinkle roasted squash with sumac, sesame seeds. Place the currants in a bowl and cover with hot water. Allow to swell, about 5 minutes. Dry off with a towel. Tear or cut the lettuce into 1-2 inch pieces, leaving smaller leaves whole. Prepare the dressing. Whisk together all of the dressing ingredients. Season with salt and pepper to taste. Make the salad. Toss the lettuce with enough dressing to your liking. Top with roasted squash, persimmon and currants. Serve immediately. This entry was posted in Salads and tagged acorn, chicories, chicory, local, middle eastern, persimmon, salad, seasonal, squash, sumac, winter. Bookmark the permalink.